Around 2 – 6 weeks after infection someone may experience a short, flu-like illness. This is caused by the body trying to fight the infection. After this, HIV may not cause any symptoms for several years. These symptoms can last for 1-2 weeks, although can be longer. They’re a sign that your immune system is putting up a fight against the virus. 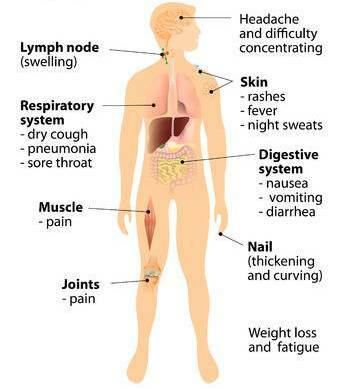 Remember, these symptoms doesn’t necessarily mean you have the HIV virus, they’re commonly caused by other conditions. If you have any of these symptoms and think you’ve been at risk of HIV infection within the past few weeks, you should get an HIV test. After the initial symptoms disappear, the virus will continue to attack the immune system, using it to make copies of itself until the body is unable to protect itself any more. Some people don’t experience any symptoms at all, therefore you should still take a HIV test if you may have been at risk at any time in the past.